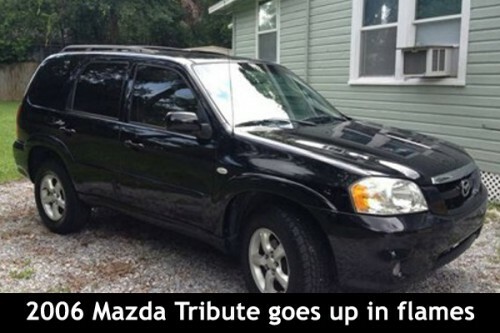 A vehicle valued at $17,000, a Mazda Tribute SUV, was completely destroyed by fire while it was parked in front of the house of the owner on Blue Marlin Boulevard in the city. Police suspect arson. The incident occurred between 1:30 and 2:00 this morning. The vehicle owner, 29, told police he was sleeping when he was awakened by his neighbors and told that his vehicle was on fire. He quickly went out to see what was happening, and saw his vehicle engulfed in flames. The Fire service was alerted; they responded quickly and the fire was extinguished. Police have since launched an investigation, but so far, have no suspects, or motive for the fire.